You have seen it on TV and in countless movies. The twenty-six mile bike path along the coast in Santa Monica Bay is a place that many a scooter rider is longing to try out. The bike path is quiet in some places and crowded in others, and some of it is really not the best place for a scooter, but nevertheless, the day you find yourself standing there with your scooter still sitting at home is a sad day indeed. As far as scooter riding is concerned, the L.A. Beach Bike Path has a few negatives and many positives. We kick scooter riders are generally not a wild, law-breaking bunch, but when it comes to this particular bike path we need to be sure to behave properly. You will find that although it is forbidden for pedestrians to walk or run on the bike path, pedestrians numbering in the thousands are one of the main hazards. And you will find that while you are having a great ride at the beach, it is important to stay alert enough to observe any signs that you come across, because failing to do so can result in a ticket and fine from one of the six different police agencies that patrols the path between the Southern and Northern ends. As we scooter riders know all too well, twenty-six miles is much too far for one day’s ride, and a fifty-two mile round trip would be beyond torture for me personally, so let’s break the path down into sections, to be enjoyed over the course of many visits. Part One: The South Bay, Torrance to Manhattan Beach. The Southern end of the L.A. Beach Bike Path is within the City of Torrance. At the intersection of Via Rivera and Paseo De La Playa are a pair of parking lots where you can grab your KickPed, Xootr, Razor A5, Micro Adult White, or whichever scooter you are the proud and enthusiastic owner of, from the trunk of your car, and stroll, or ride your brake, down a short pathway to the beginning, or end of our legendary trail. There is a restroom here so you can be sure you are ready to concentrate on the scoot. Here you will start to get used to fairly smooth concrete surrounded by yellow sand and the Pacific Ocean a few yards off to your left. After three minutes or so you will have traversed from Torrance into the City of Redondo Beach. To your right will be a steep grassy bank. The constant ocean breeze rises up this bank, and on the street at the top there are quite often people with radio controlled gliders and various kites taking advantage of the updraft. The bike path is virtually straight all the way from the Torrance end to Mile 2, Redondo Beach Pier, where it becomes complicated. When you get to the pier, you may as well dismount and fold it up, because that is the only way you can be guaranteed to get through this section without a ticket and a fine. The Redondo Beach Police have been known to issue tickets to scooter riders here, despite the laws of scooter riding being unknown to almost everyone, including the police themselves. Cyclists are required to walk their bikes, and skaters are technically required to remove their skates in the immediate area of the pier. Those who leave the path and go up to the street to avoid the pier will find that the only way safely through is to stop and put a foot down for three seconds at every stop sign, never ride in a pedestrian crosswalk and generally pretend you are taking a test for a drivers license at every moment. As far as scooter riders are concerned, just walk it or carry it to be on the safe side. You will soon be past the pier and able to scoot again. But it would be shame not to take a break here and walk around the pier with scooter in hand. North of the pier you will not have a sandy beach on your left for a while as the bike path skirts inland of the Redondo Beach Marina and King Harbor. There are many restaurants in this area so if you are hungry you can carry your scooter to your table and get fueled. Officially the bike path crosses the road (North Harbor Drive) and becomes a bike lane here until you get past the various marinas on the left, and then a left turn puts you back on the strand and onto the sand again. However, scooters, skates, runners and slower cyclists can simply cut through the various parking lots on the left instead, and avoid sharing the road with cars. To see exactly what I mean here look at the route on Google maps from the South end of North Harbor Drive to Herondo Street. At Mile 3, Herondo Street the path takes a sharp left and right and then you once again down on the sand and free to ride. To your right will be the houses on The Strand and there will be beach volleyball nets to your left. And you will also be in your third city of the day, Hermosa Beach. Note that Herondo is a portmanteau of Hermosa and Redondo and marks the boundary between these two cities. Here, as in Southern Redondo Beach, the path is straight. There is no room for pedestrians, but there will almost certainly be many, getting in the way, and despite your slow speed on your scooter, it will be the bicycles that hold you up as people stop to chat. This is no place for a race and it is best to get into the slow flow of things and not be in any hurry. The next major landmark is Hermosa Beach Pier. Pier Avenue is a crowded, booze-happy place that spills across the bike path. You should always step off and pick up your scooter when you pass the pier. For two blocks on either side of the pier, the bike path has signs telling you to walk your bike. Of course you won’t have a bike with you, but walk your scooter to be safe and legal. If you take a detour up Pier Avenue, which is for pedestrians, don’t scoot unless everyone else is, because there is the potential for a violation here also. 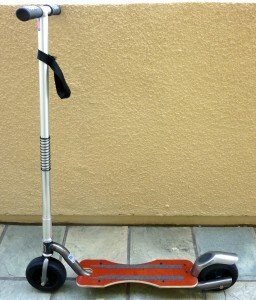 I’ve passed this point on all manner of scooters, bicycles and skates over the years, but since I have had my KickPed scooter from NYCeWheels, I have found the easy folding aspect of the design makes a walking break very easy. No time is wasted with Ergo-pins, turning bolts etc. From riding to carrying folded, or vice-versa literally takes three seconds. 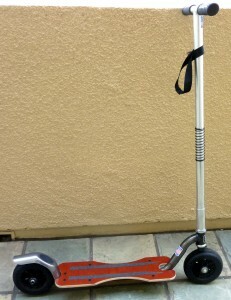 The KickPed, is ideal for alternating on and off kick scooter riding. Continuing North, it is again a long, straight, beach level bike path, and by this time you will be hankering for some carving turns, But there are none this far South. At 35th Street there is another sharp right and left where it is best to walk. You will observe that cyclists seem to find this spot very annoying, but we scooter riders are usually in much less of a hurry and we don’t mind stepping down and taking our time. This point between Mile 4 and Mile 5 also marks the approximate border between Hermosa Beach and Manhattan Beach, our fourth city so far. From here it is a short ride up to Manhattan Beach Pier, our third pier so far. This is a nice pier to walk along. It is slightly uphill towards the ocean end where there is a cafe, and also the Roundhouse Marine Laboratory and Aquarium, which is worth a visit. Heading back down the pier toward land it is slightly downhill. If you are sure you see no police and it is not too crowded, you can risk a free-coast back to shore. The Southern section of the L.A. Beach Bike Path is not the part you see on the big screen or TV. There are more locals and fewer tourists. The vibe is not as frantic as it is in Venice and Santa Monica. But we will be covering those sections later, and they are great scoots! So far we have ridden about five and a half miles, from the Torrance end to Manhattan Beach Pier, not counting walks along the piers etc. Add the five and a half miles back to the car and this is way beyond the recommended distance for a leisurely scoot. But if you are making a full day of it, perhaps eleven miles is something you could take on. If not, break this Southern section into two or three shorter visits, and adjust your parking spot accordingly. Always remember, when riding a scooter in one direction, you need to have enough energy to get back again. Of course if you do over-extend yourself, you can always take a taxi back!